Malignant gliomas are extremely aggressive and lethal form of brain tumors. Despite considerable advances in surgery, radiotherapy and chemotherapy, the prognosis for patients with gliomas remains poor. Molecular markers for early detection are fundamental to develop targeted treatments and to improve the outcome for patients with glioma. microRNAs (miRNAs) are a group of small, endogenous, noncoding RNA molecules that regulate a wide spectrum of gene expression in a posttranscriptional manner. Altered expressions of miRNAs have been associated with various malignancies including brain tumors. As a promising therapeutic tool against malignant gliomas, miRNAs have attracted increasing attention in recent years. In situ hybridization (ISH) technique with variant probe design or signal amplification allows direct assessment of miRNA expression within formalin-fixed, paraffin-embedded (FFPE) tissue. By using this method, the miRNA expression pattern in FFPE tumor tissue has been explored in many tumors. 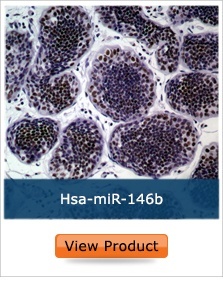 BioGenex is pleased to launch four Super Sensitive Nucleic Acid microRNA in situ hybridization (SSNA miRNA ISH) probes for subtyping and grading of gliomas. 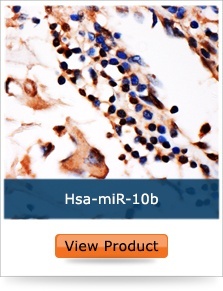 BioGenex SSNA miRNA ISH probes give consistent, reproducible and reliable outcomes. The ready-to-use BioGenex miRNA ISH probes efficiently detected miRNA expression pattern in FFPE brain tumor. This novel assay used 35 FFPE cases of different brain tumors (astrocytoma, oligodendroglioma, meningioma and glioblastoma) and 30 low-and high-grade gliomas. 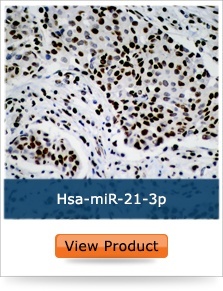 Consistent with the high throughput screening reports, miR-10b was downregulated and miR-21 was upregulated in high-grade gliomas. 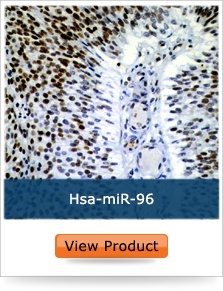 The study results demonstrate SSNA miRNA ISH probe can serve as a potential therapeutic target for interventions in high-grade gliomas. Furthermore, visualization of miRNA expression is an advantage of ISH-based techniques over the PCR and microarray-based detection that lacks spatial information. Please click on below link to download Biomarker Panel and Application Note for glioma subtyping and grading.